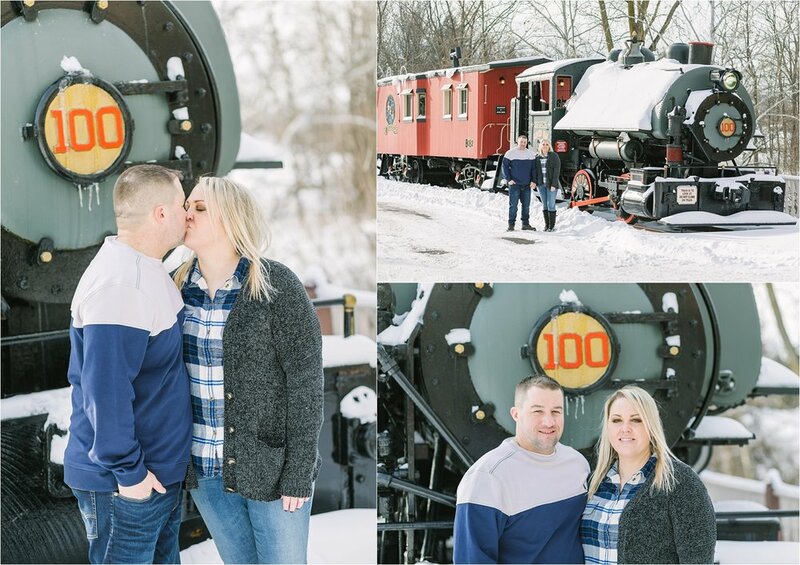 Following a major winter storm last week, Donny & I traveled to Olmsted Falls to capture the love between two individuals we had been eager to meet for months, Lauren + Drew. Lauren & I had been planning this session for a while around the weather, waiting for festive conditions & freshly fallen snow. We were in luck this week. NE Ohio received a thick blanket of snow, and we got even more than we needed—about 10 inches too much, probably! That being said, we couldn’t pass up the chance to make the most out of this winter wonderland. 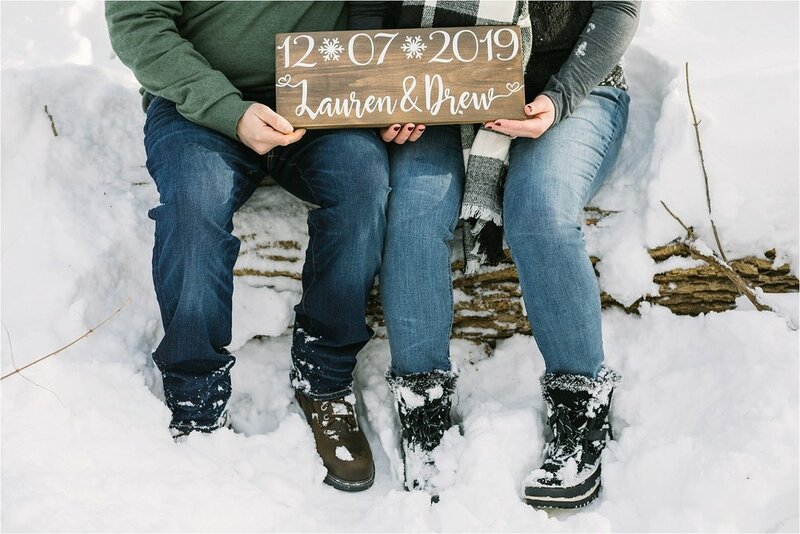 Although it was a challenge to work in (and trudge through) at times, we enjoyed it—wet socks, frozen fingers, and all :) This session was amazing for a few simple reasons: awesome clients, gorgeous scenery, and, of course, a once in a two or three year snow fall we had just received. Over the course of our session we photographed at several locations in or near David Fortier River Park. The first spot we chose to shoot at was a classy, wooden covered bridge crossing the river. This small town gem was the perfect backdrop for Lauren + Drew. It has such a beautiful midwestern way about it, especially with all of the wintry scenery encompassing it—sun rays and landscapes peaking through its open windows. This was definitely one of our favorite spots during the session. One of the many reasons I love Ohio. SO PRETTY! Check out the icicles behind them in the photo to the left. Crazy! Isn’t Lauren’s ring a beauty?! 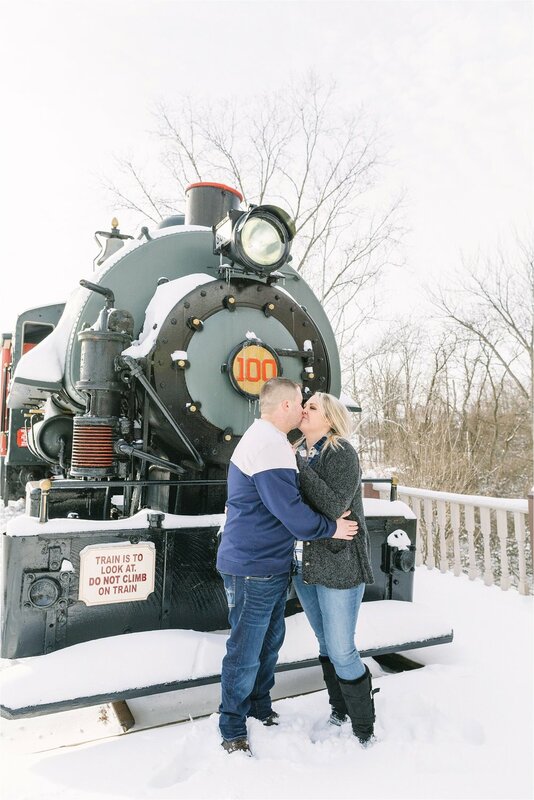 After spending an hour at the park, we decided to drive up the road to take a few more photos of Drew & Lauren with a locomotive. There were also some adorable little shops located close by that Donny & I will definitely be revisiting when our feet and hands aren't frozen! 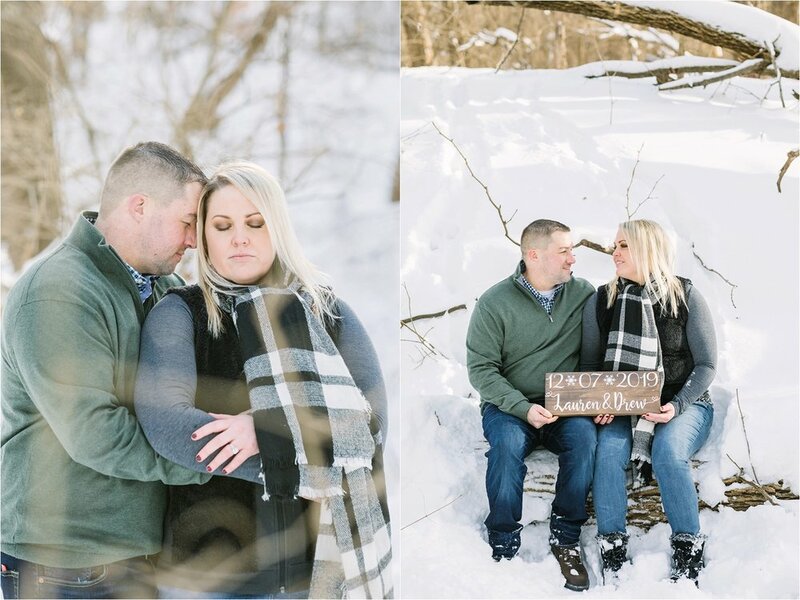 These shots came out so cute and offered the perfect complement to the outdoorsy nature of this winter session. Great call Drew + Lauren!